Nan Elmoth are a band from San Luis Obispo, California that has been featured before in this zine and plays an epic form of black metal and this is a review of their 2017 album "Void Serpent" which will be released on July 28th on cassette by Pacific Threnodies. Distorted amp sounds start off the album before going into a very fast and raw musical direction that also uses a great amount of tremolo picking and blast beats while t he vocals are all high pitched black metal screams and the music also mixes in a great amount of second wave influences. All of the tracks are very long and epic in length while the songs also bring in a great mixture of slow, mid paced and fast parts and after awhile the riffs start utilizing a small amount of dark sounding melodies and guitar solos and leads are only used briefly while the songs mix in a perfect balance between being influenced by both the European and American styles of black metal and they also mange to capture a touch of folk music into their raw style. 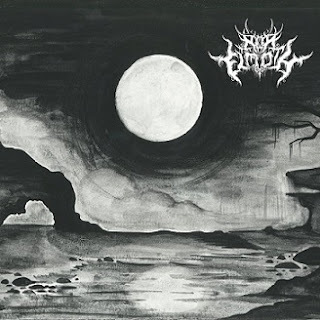 Nan Elmoth creates another recording that remains true to the raw and epic style of black metal that was established on previous releases, the production sounds very dark and raw while the lyrics cover Earth Worship and Ancient Wisdom themes. In my opinion this is another great sounding recording from Nan Elmoth and if you are a fan of raw and epic black metal, you should check out this cassette. RECOMMENDED TRACKS INCLUDE "Ravaged By War And Plague" and "To Walk The Path". 8 out of 10.